Welcome to the official website of the European High Pressure Research Group (EHPRG). EHPRG is non-profitable academic association established in 1963 which is devoted to science and technology of matter under high pressure. It organizes an annual meeting which brings together hundreds of scientists of various fields, mainly physics, chemistry, Earth and planetary sciences, bio- and food science and technology. The reasonable size of the group, low conference fees, and a friendly relationship between the attendants have made EHPRG meetings a major event in the European high-pressure community for more than half a century. 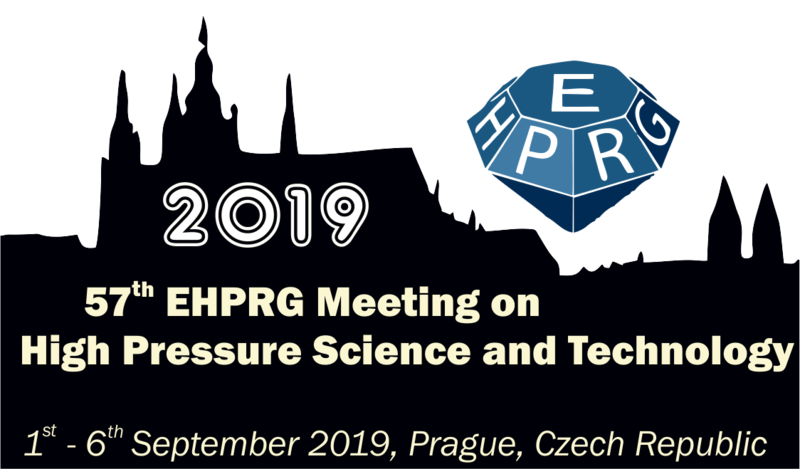 The 57th European High Pressure Research Group Meeting on High Pressure Science and Technology (EHPRG-2019) will be held in Prague, Czech Republic, from 1st to 6th September 2019. The 57th EHPRG Meeting will be chaired by Jiří Prchal (Charles University, Prague, Czech Republic). For more information, please visit the official webpage of the 57th EHPRG Meeting. Selection of high-pressure related titles from top scientific journals. The Journal of Chemical Physics, Volume 150, Issue 14, April 2019. 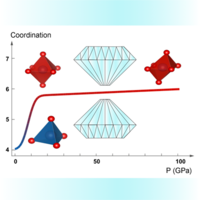 In this article, we present a molecular thermodynamic study of a system of N particles contained within a volume V and interacting via a hard-core pair potential with an attractive interaction according to the Wolf model for charged systems. This variable-range potential is characterized by three parameters: the repulsive hard-core diameter σ, the energy-well depth ϵ, and the inverse range α; a fourth parameter of the model is a cut-off distance xc that depends on α according to the relation xc = 2/α. Two equations of state (EOSs) are presented and derived from thermodynamic perturbation theory and Monte Carlo (MC) simulation data. The first EOS is given by the standard Zwanzig’s high-temperature expansion of the Helmholtz free energy, where the first three perturbation terms a1, a2, and a3 were obtained from MC simulations in the canonical ensemble (NVT) and parameterized as functions of α and the reduced density of particles ρ* = Nσ3/V. The second EOS was obtained from the discrete perturbation theory applied to a discrete representation of the Wolf potential. Results for pressures, internal energies, and isochoric heat capacities are compared to the MC computer simulation data of the Wolf system, including vapor-liquid coexistence curves, for different values of α. Overall, both EOSs give a very good representation of the thermodynamic properties of the Wolf fluid when 0.3 ≤ α ≤ 1.0 and 0.05 ≤ ρ* ≤ 0.8. Since the Yukawa fluid can reproduce information of screened ionic interactions, we discuss the equivalence between the Wolf and Yukawa fluids in the context of equivalent systems in liquid theory. Molecular dynamics simulations are used to investigate microscopic structures and dynamics of methanol and methanol-water binary mixture films confined between hydrophobic infinite parallel graphite plate slits with widths, H, in the range of 7–20 Å at 300 K. The initial geometric densities of the liquids were chosen to be the same as bulk methanol at the same temperature. For the two narrowest slit widths, two smaller initial densities were also considered. For the nano-confined system with H = 7 Å and high pressure, a solid-like hexagonal arrangement of methanol molecules arranged perpendicular to the plates is observed which reflects the closest packing of the molecules and partially mirrors the structure of the underlying graphite structure. At lower pressures and for larger slit widths, in the contact layer, the methanol molecules prefer having the C–O bond oriented parallel to the walls. Layered structures of methanol parallel to the wall were observed, with contact layers and additional numbers of central layers depending on the particular slit width. 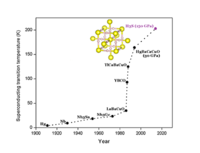 For methanol–water mixtures, simulations of solutions with different composition were performed between infinite graphite slits with H = 10 and 20 Å at 300 K. For the nanoslit with H = 10 Å, in the solution mixtures, three layers of molecules form, but for all mole fractions of methanol, methanol molecules are excluded from the central fluid layer. In the nanopore with H = 20 Å, more than three fluid layers are formed and methanol concentrations are enhanced near the confining plates walls compared to the average solution stoichiometry. The self-diffusion coefficients of methanol and water molecules in the solution show strong dependence on the solution concentration. 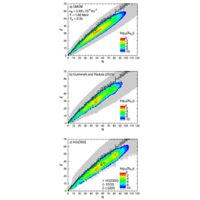 The solution mole fractions with minimal diffusivity are the same in confined and non-confined bulk methanol-water mixtures. X-ray emission spectra reveal that under pressure conditions of Earth’s lower mantle, the compaction mechanism in amorphous germanium dioxide on the atomic scale is similar to that of its crystalline form. 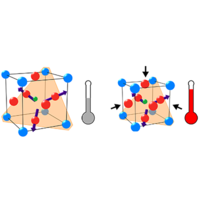 Experiments reveal that Mn3NiN has enormous ability to control heat flow when subjected to mechanical pressure, establishing the family of Mn-antiperovskite materials as promising tools for energy-efficient refrigeration. The effect of adding high pressure as a control parameter in solids, liquids, and gases expands opportunities to observe unexpected novel phenomena and understand matter in extreme environments. This review on high pressure science highlights subjects ranging from quantum criticality to Earth science. State-of-the-art experimental methods at megabar pressures are also discussed. The proliferation of pressure-induced phases illustrate promising new directions for this field of research. 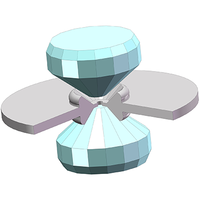 Even after three decades of development, high-temperature superconductivity remains one of the most challenging theoretical and experimental areas in condensed matter physics. In this Colloquium some new discoveries in this area are reviewed and possible routes toward much higher transition temperatures are analyzed. What are the thermodynamic properties of matter at extreme densities, even exceeding nuclear matter density severely? How can we describe the composition of matter for such conditions, the resulting pressure, and the maximum mass of cold neutron stars? How is this affected by finite temperatures, as they occur in core collapse supernovae and in compact star mergers? This review addresses these points within the framework of constraints from experiments as well as astronomical observations.